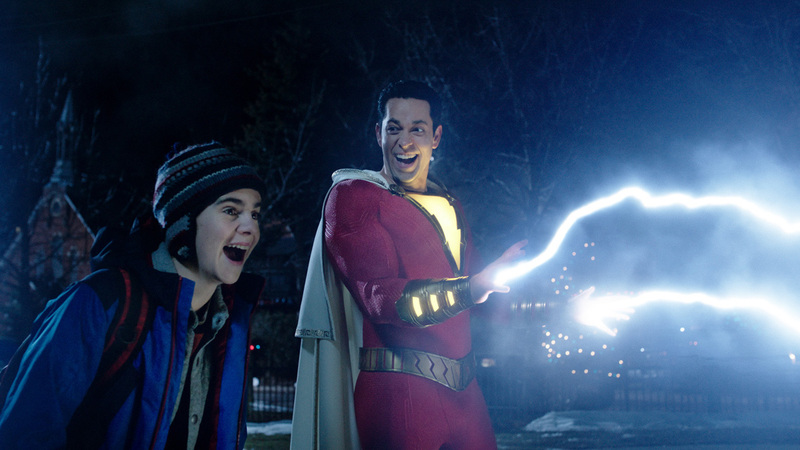 Zachary Levi and jack Dylan Grazer in SHAZAM! Courtesy of New Line/ Warner Brothers Pictures. Director David F. Sandberg’s SHAZAM! marks a sea change for the DCEU. Not only is this a colorful, vibrant and vital addition to the franchise, more importantly, it doesn’t devolve into a tired climax where the hero and villain square off in a zero-stakes CG-assisted battle. There are real stakes and funny gags in this superhero comedy about a fifteen-year-old foster kid uncovering his superpowers. Vivid character-driven action, heartrending central relationships and fully earned, totally satisfying emotional moments make this a super-powered BIG (a comparison the filmmakers thoughtfully embrace). It’s super hilarious, super thrilling and super awesome. The search for one’s identity, destiny, or purpose is not something new in superhero movies, but Sandberg and screenwriter Henry Gayden (working from a story by Gayden and Darren Lemke) level the playing field. They make this hero’s origin story just as much about the genesis of villainy. Evil’s machinations begin in the backseat of a Cadillac sedan on a chilly Christmas drive. Thaddeus Sivana (played in early years by Ethan Pugiotto, later by Mark Strong) is constantly the target for his dad and older brother’s harsh negativity. But his world changes when he’s called into a mysterious lair, “The Rock of Eternity,” and tested by a wizard (Djimon Hounsou) to become the next champion of good. Unfortunately, he fails because he’s easily seduced by demons representing the seven deadly sins, entombed in cement statues controlled by a shiny orb. He’s jettisoned back to the real world and dedicates the rest of his life to figuring out how to return. Decades later, a similar kind of familial toxicity affects another teen: Billy Batson (Asher Angel) was abandoned by his birth mother at a young age and has been on her trail ever since. His mischievous behavior has landed him in and out of foster homes. The system hasn’t worked for him, by his own hands. Given an ultimatum by his social worker, he’s placed in the care of the super supportive, caring Rosa and Victor Vasquez (Marta Milans and Cooper Andrews, respectively). There he’s introduced to a crew of fosters, Darla (Faithe Herman), Mary (Grace Fulton), Eugene (Ian Chen), Pedro (Jovan Armand) and Freddy (Jack Dylan Grazer). If that’s not enough of a life-change, Billy is summoned to the Rock of Eternity, and in an act of desperation on the aged great wizard’s part, is given the power of the gods and turned into a muscular, red-suited, adult superhero (Zachary Levi, whose performance is pristine). And not a moment too soon. Dr. Thaddeus Sivana has unleashed the demons and is threatening to take over the world with his new found power. 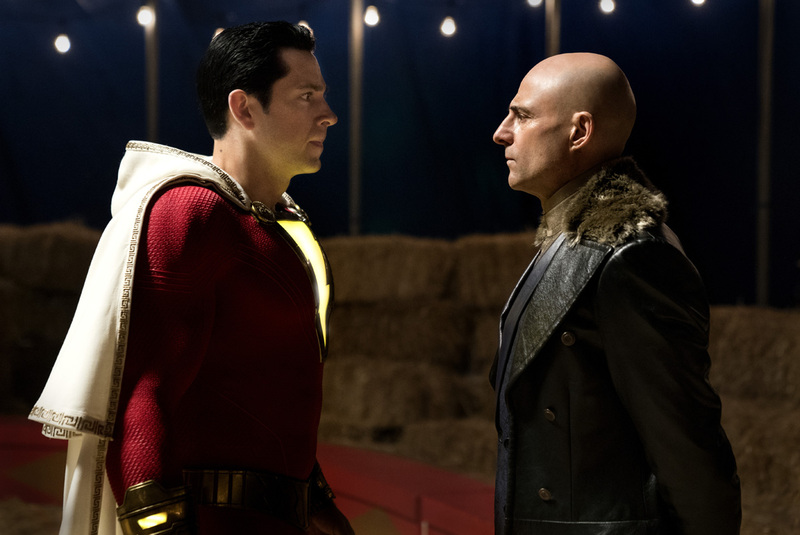 Zachary Levi and Mark Strong in SHAZAM! Courtesy of New Line/ Warner Brothers Pictures. What makes this film function perfectly are the relationships between the characters. It’s the driving force of the action. Though they inhabit a pushed reality where superheroes like Superman and Batman exist, the emotional pull is always grounded. The struggle between good and evil is contextualized by the childhood trauma both Billy and Thaddeus endured. The villain’s clear motivations make him all the more imposing – he’s no mere mustache-twirler. Things get intense when Thaddeus crashes his father’s company meeting and sics his gargantuan, gnarly red-eyed beasts on his brother, father and the board members. Billy’s friendship with Freddy is a spiritual cousin to that of BIG’s Josh and Billy. The filmmakers really lean into it too. The pair share a similar rapport and get into shenanigans as kids would do in a wish-fulfillment fantasy. The montage of the pair experimenting with Billy’s new identity and powers provides undeniable charm and energy. Supporting characters – like the foster kids – are well-established in a short amount of time. Each has a distinct personality that fuels the scenes. Sandberg’s vision is wonderfully executed without any pretension. One of the best in the DCEU canon, SHAZAM! is a triumph. Superb, sweet and smart, this is a feel-good superhero movie you’ll want to see over and over again.